The photos on this website, whether provided by me or other contributors, are intended for use solely on this website, and may not be otherwise used without permission. 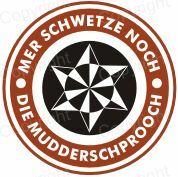 This is a reference-only website, no plate sales. What's new in the last 30 days? Here's the latest high 82nd Airborne Division Association plate spotted by Preston Turner. The previously reported high was 00269A/B, which was still sporting a validation sticker. These plates date back to 2007, and are also available in a personalized version. 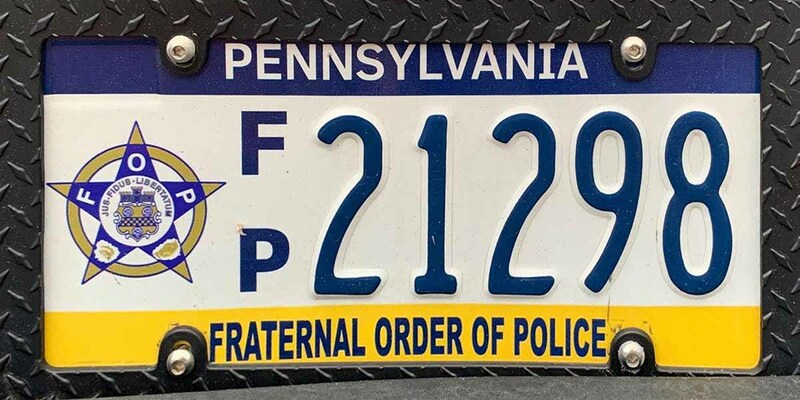 This Fraternal Order of Police plate was recently photographed by Jordan Irazabal. This plate still has the sticker well and helps to narrow down the point at which that feature stopped being issued. Then there was a run without the sticker well, and before the map outline came out. 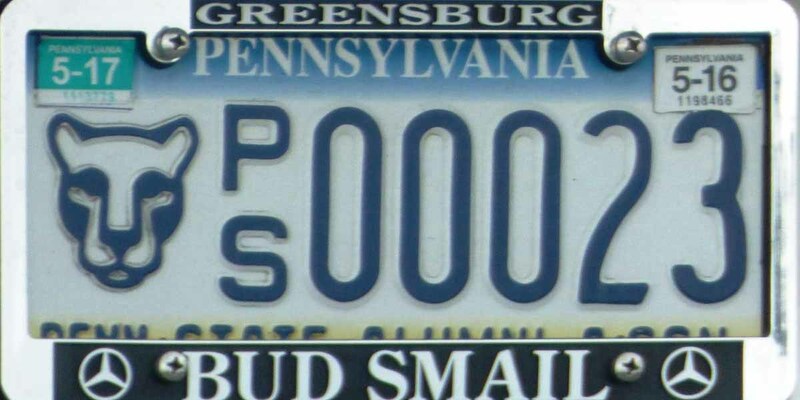 The Penn State Alumni Association was one of the earliest organizational plates dating back to 1985, but if you wanted a Penn State tag and were not a member of the Alumni Association, then the Penn State University plate, as shown here, was an option. These became available in 2009, and now with the map outline as can be seen here in this photo from Tom Perri. Jordan Irazabal also recently spotted 11174P/S but was not able to get a picture. This is the only Villanova University vanity photo I've seen. Thanks to Jeff Lawson for the image. Note that the plate has the latest feature of the map outline. Their plate program dates back to 1987. 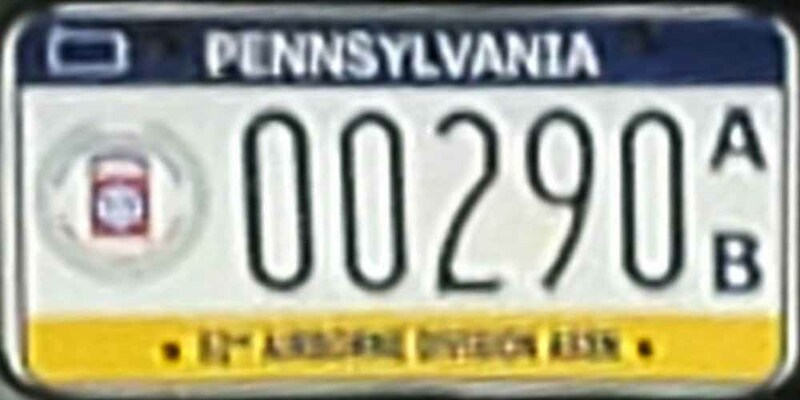 There was a graphic redesign in 2006; however, the redesigned plates were not spotted until 2009. 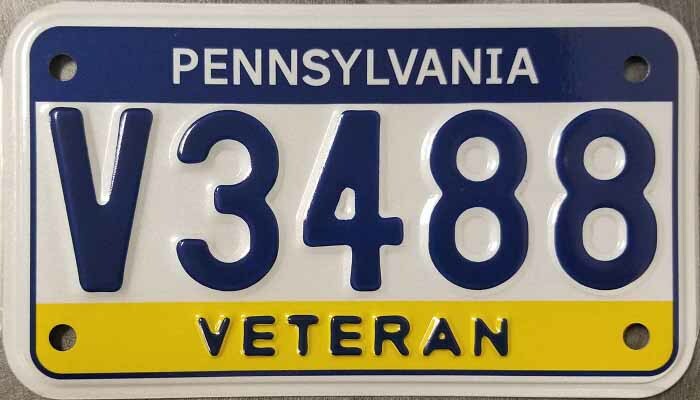 These are the first images of a Severely Disabled Veteran plate that is part of the 2 plate series intended for use on a vehicle that carries a wheelchair or personal assistive device. Such vehicles are authorized to be issued two plates since the assistive device and carrier may block visibility of the vehicle mounted plate. In the photo shown here no assistive device or carrier is visible. Originally I had listed this series as starting at D/V98000. This is not the case with the starting point actually at D/V99000. Thanks to Preston Turner for the photo and to Tom Perri for passing it along. Here's a recent shot and a new high of the latest generation Official Use Dept. of Transportation Commercial plate. 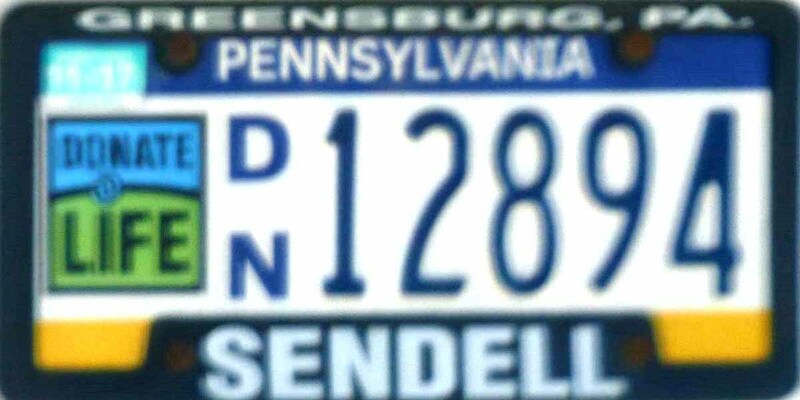 In simpler terms it's a plate on the rear of a PennDOT truck, thus the PennDOT logo on left. 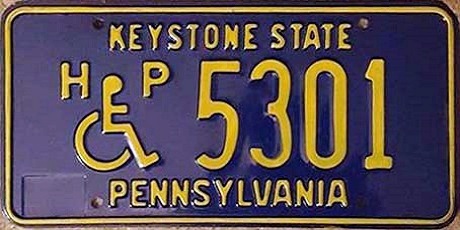 This is also one of the agency-specific plates which also includes a PA Turnpike edition with their logo and a generic version with the state coat of arms. Back in February Matt Ciecka spotted this high number We The People plate, Commemorating the 200th anniversary of US Constitution. 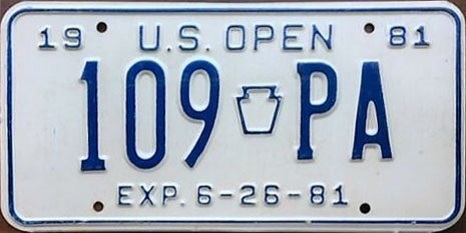 This plate was only issued during a 3½ month period in 1987 ending on December 31 of that year with fewer than 5000 being issued. This is the only remaining legal yellow on blue plate. The actual high is believed to be U/S04635, only three numbers above the plate shown here. I am fortunate enough to have an unused mint condition plate in my collection — sorry, not for sale. 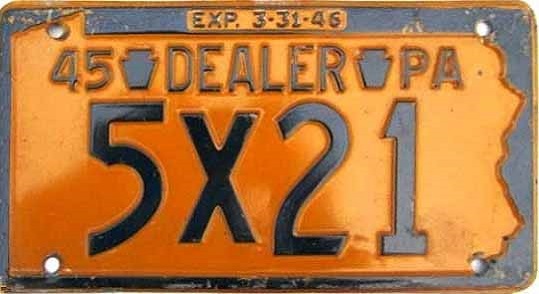 This is a 1945 Format 2 Dealer plate. This serial group could run from from 1X00 to 9X999, although according to the Archives, the series likely ended around 8X921. Format 1 plates included X100 to X9999. The plate size was 6 inches by 11 inches for all plates. Thanks to Pl8source for the use of the picture. 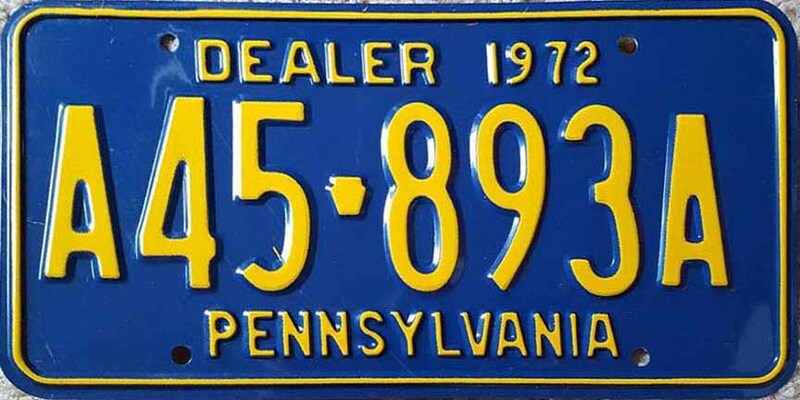 Here is an unused, near mint condition, 1972 New Car Dealer plate photo from Tom Firth. This series started at A10-000A and went at least as high as the plate shown here. 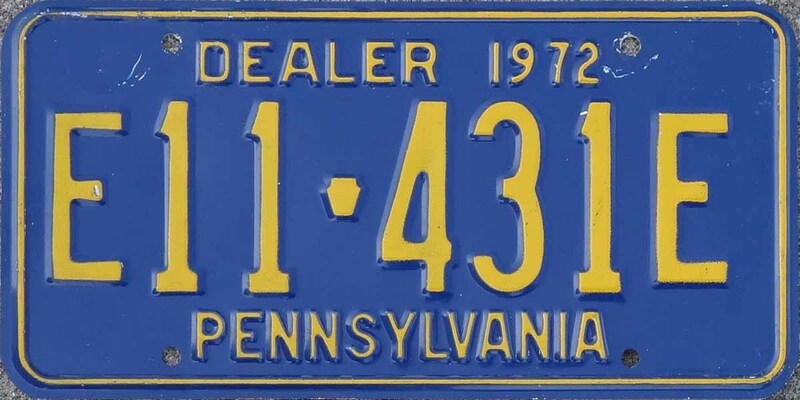 Other full size dealer plates at the time included B series Used Car Dealer, C series M.V. Business, D series Tractor Dealer, and E series Trailer Dealer. 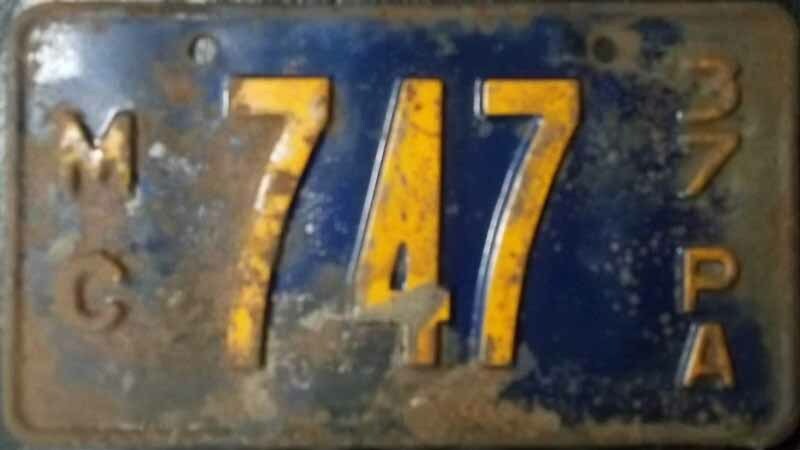 This is a 1931 Format 7 Passenger plate. Format 7 included the serial progression of AA to ZZ999. So 2, 3, 4 and 5-character plates were part of this group. Plates up to 4 characters measured 6" by 10", and 5-character plates were 12" as shown here. The photo gallery has an example of each of the four character lengths. Thanks to Kenny Kuhns for the use of this plate photo. 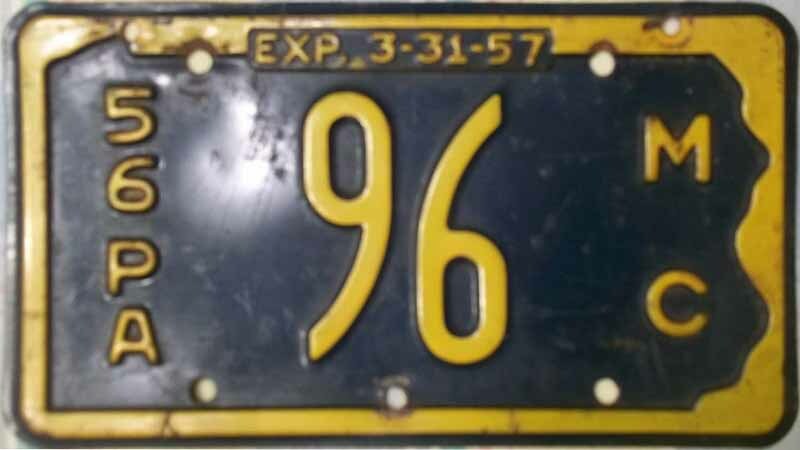 This is a 1946 Format 3 Passenger plate. That group included the series of 1A00 to 9Z999, so again there are both 4 and 5-character plates. Beginning in 1945 the plate size became 6 inches by 11 inches regardless of the number of characters. And again the alpha character is always last to advance regardless of the number of characters. This photo was from an ebay seller who did not want credit. 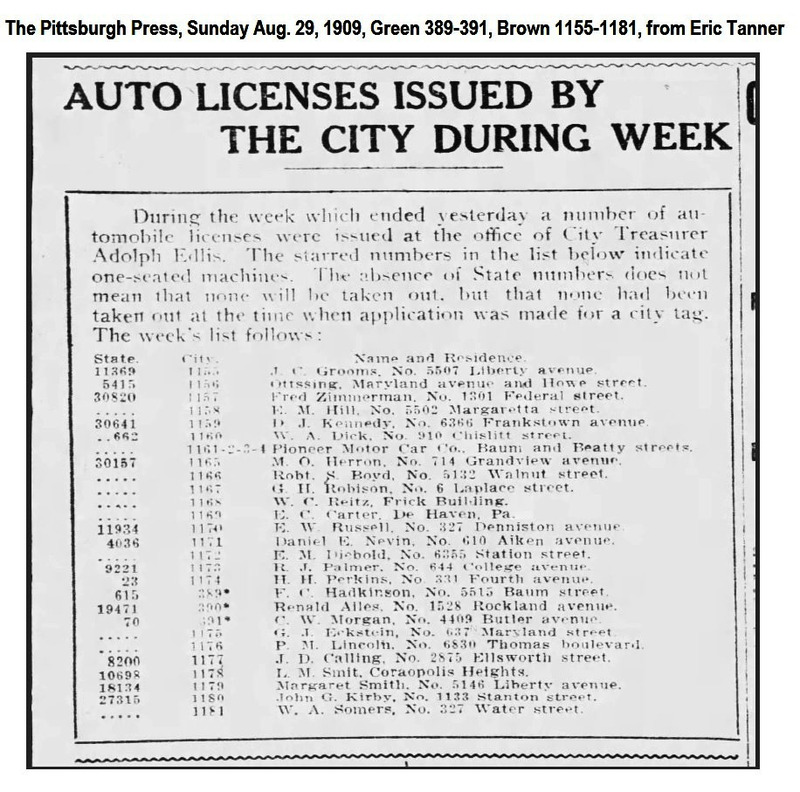 On the news front, Charles Sweitzer has shared an article from the York Daily Record concerning registration stickers, or the absence thereof. The article describes a number of issues that have resulted from discontinuing registration stickers. It also speaks of proposed legislation to incorporate the registration sticker and the inspection sticker. Here's another news article from Penn Live describing some of the failures of the current system. 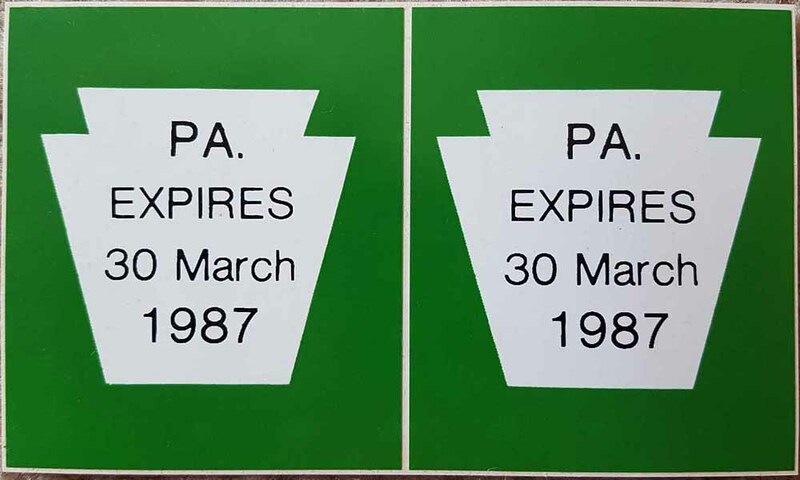 One observer commented that the anticipated $3-million savings to PennDOT has turned into a $22-million shortfall from owners not keeping up with registration renewals. Here's the latest high Distracted Driving Awareness plate from Jerry McCoy. These plates have only been on the road a short time, with the serial numbers apparently starting at D/A00101. 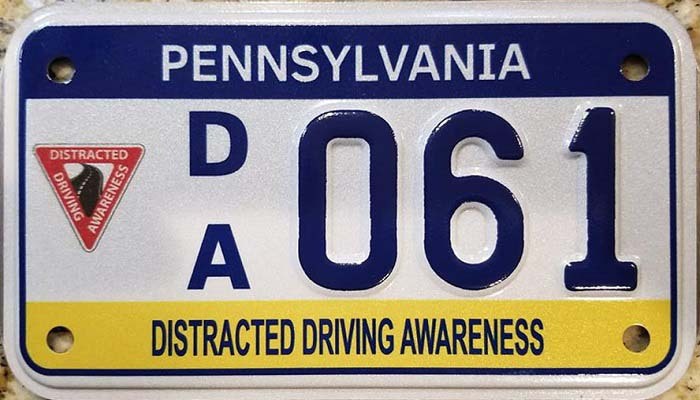 The theme of this plate is certainly timely — just watch what other drivers are doing, but don't get too distracted. Nice shot of a recent Dealer plate from Jordan Irazabal. 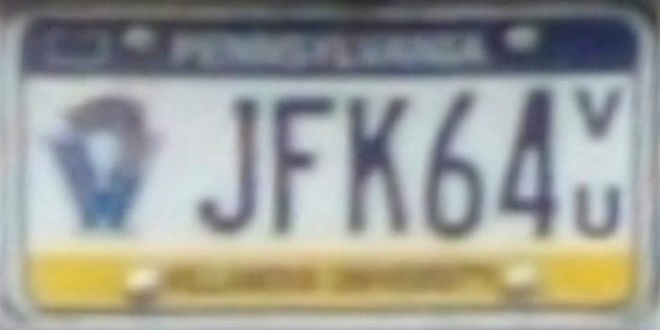 This plate, K51-779, is the lowest plate spotted with the map outline. It is believed that the map was added at K51-500K. A few weeks ago Bruce Bufalini snapped a photo of K52-570, which is the current high. 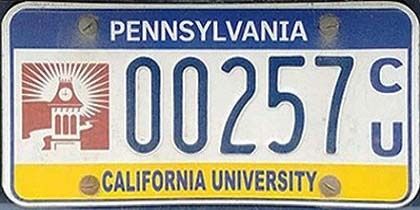 This California University (of Pennsylvania) plate was recently spotted by Bruce Bufalini. The plate is a new high and Bruce believes that the plate does not have the sticker well. The previous high of 00233C/U had the sticker well but was spotted back in 2013 according to Tom Perri's highs website. 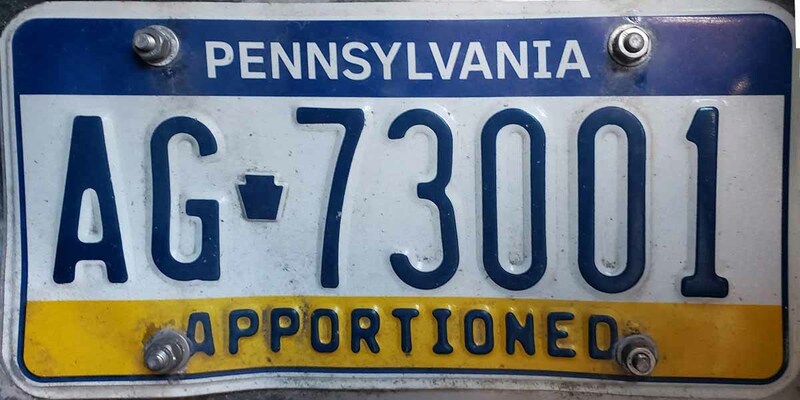 This is a low number Penn State Alumni Association plate that was spotted recently by Bruce Bufalini. This plate likely dates back to 5/30/2001 when the original crop of plates was being replaced by the www base. After a couple facelifts, the Nittany Lion continues on with the current high not far below P/S30000. 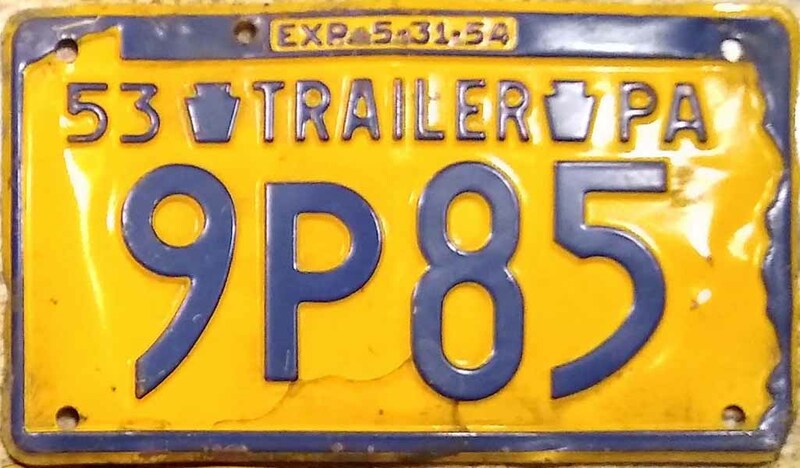 This plate doesn't look like anything special, but it's the early Trailer Dealer plate dating back to 1972. Judging by the number, there could be others. The starting point would have been E10-000E. 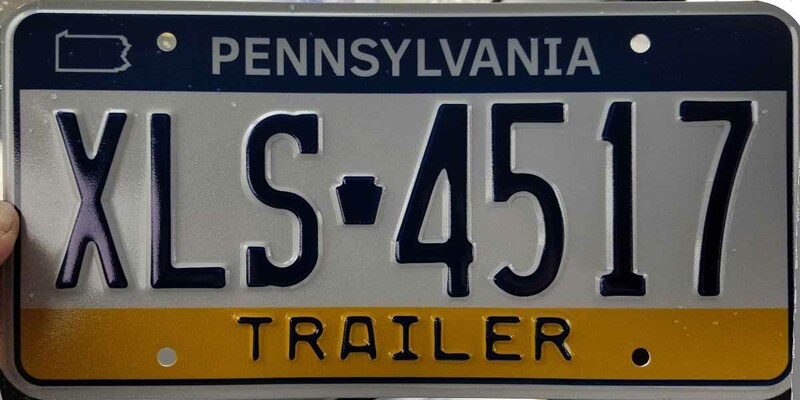 It is believed that the Trailer Dealer plate series likely began in 1971, but so far no plates have surfaced to confirm that. Here is a nice 'shorty' 1933 Format 5 Passenger. This format group went from 000A to 999Z9, so both 4 and 5 characters plates were issued; however, all of the numerals in each letter series would have been used before the letter would advance. The 4 character one shown here measures 6 inches by 10 inches, while 5 character plates would be 12 inches wide. Thanks to eBay user Scrane2006 for the use of this photo. This is another gem, and another 'shorty' plate. 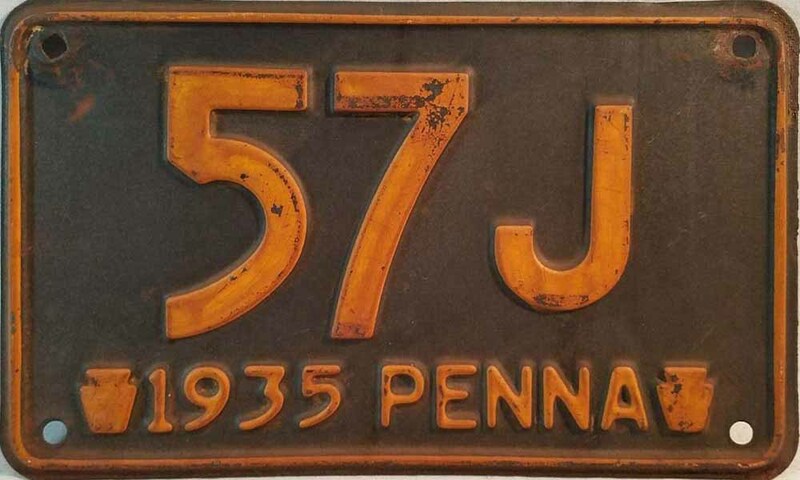 It's a 1935 Format 4 Passenger plate, which ran from 00A to 99Z9 and which measure 6 inches by 10 inches, and 10A00 to 99Z99 which are 6 inches by 12 inches in length. Like the 1933 plate above, all of the numerals in each series would have been issued before the letter would advance. Thanks to eBay user Ykessa for the use of this photo. Here we have two 1930 Truck plates. 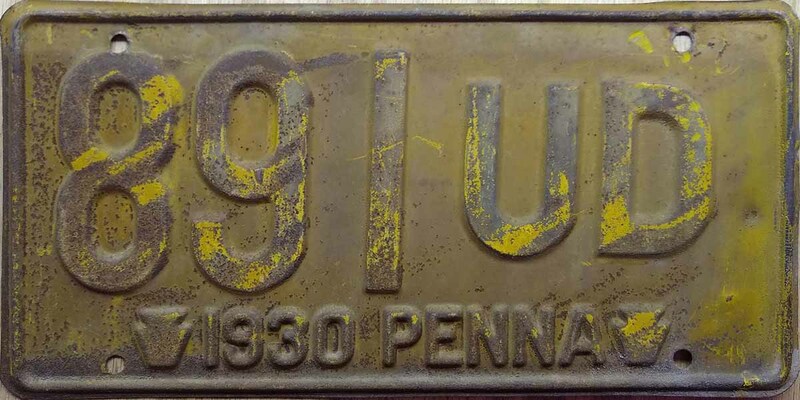 1930 was an odd year for truck plate formatting. The same classes of R through Z and ZZ were used but there was no identifying prefix letter as used in earlier and later plates. 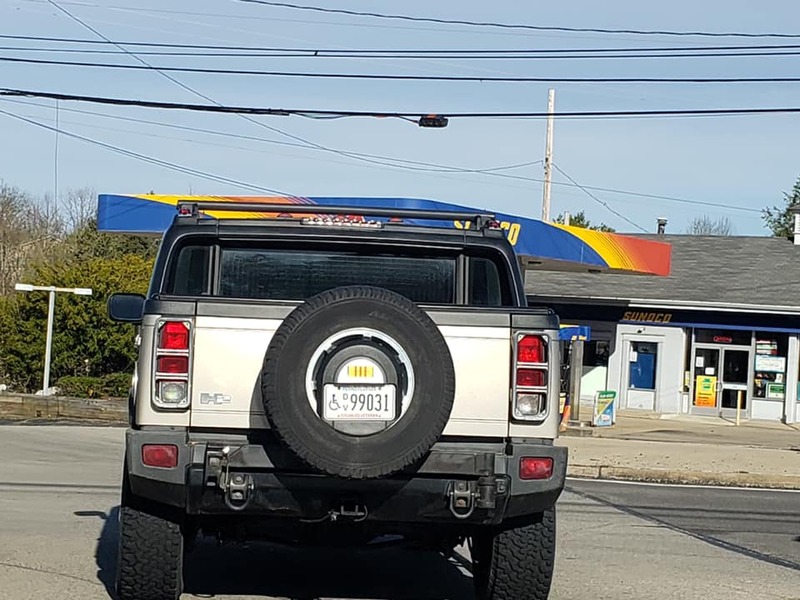 Confusing, and a little hard to identify them as truck plates. The plate on the far left is an S-Class, which ran from 00GA to 999KZ. This plate is thanks to eBay user Powerfullhammer. The other plate is actually a Z-Class tag which ran from 00UA to 999UZ. This 1981 U.S. Open special event plate display is a little out of the ordinary for this site but I had a few images that were never shown before and one new photo. So, here they are. From left to the 14 plate may have come from eBay, 44, 47 were John Willard plates, the 56 plate was from Bill Houser, 97 was also another John Willard plate, and the newest plate, 109 is thanks to Phil Tedeschi. Concerning the 56 plate, the reason for the color difference is unknown. 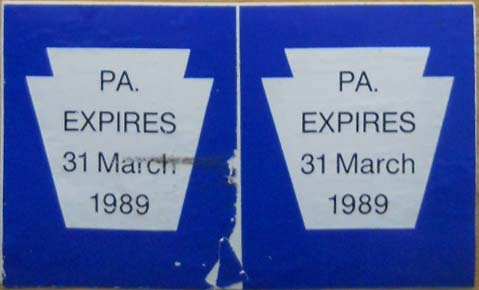 The state still offers special event plates but most of the plates in recent years have been black and white cardboard — not very appealing and not easy to collect. I did not see this one previously in Act 91, and apparently neither did PennDOT. 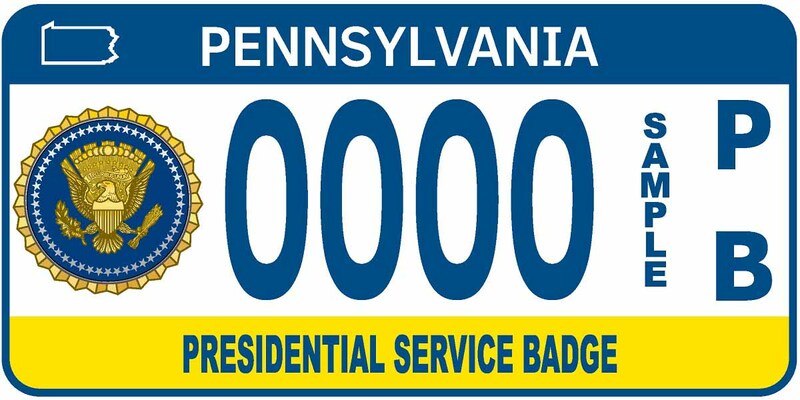 The Presidential Service Badge plate was just recently announced in PennDOT Bulletin 19-07. The plates is based on the military award, and according to Wiki, those who serve as full-time military staff to the President of the United States would be eligible. It may not be an easy one to spot. So far no plates have been issued. 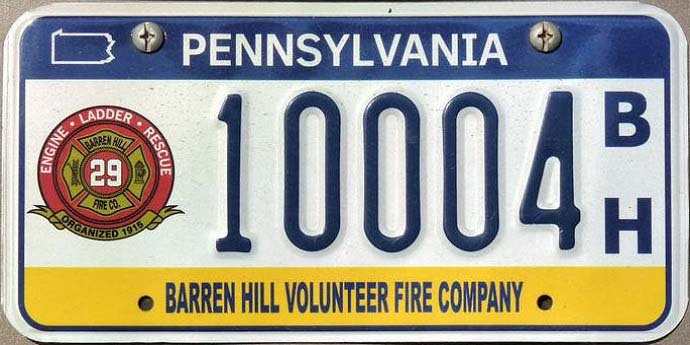 This is the first image of a serial-numbered Barren Hill Volunteer Fire Company plate, although Tom Perri also posted it in his most recent update. The photo was actually taken by Jordan Irazabal. 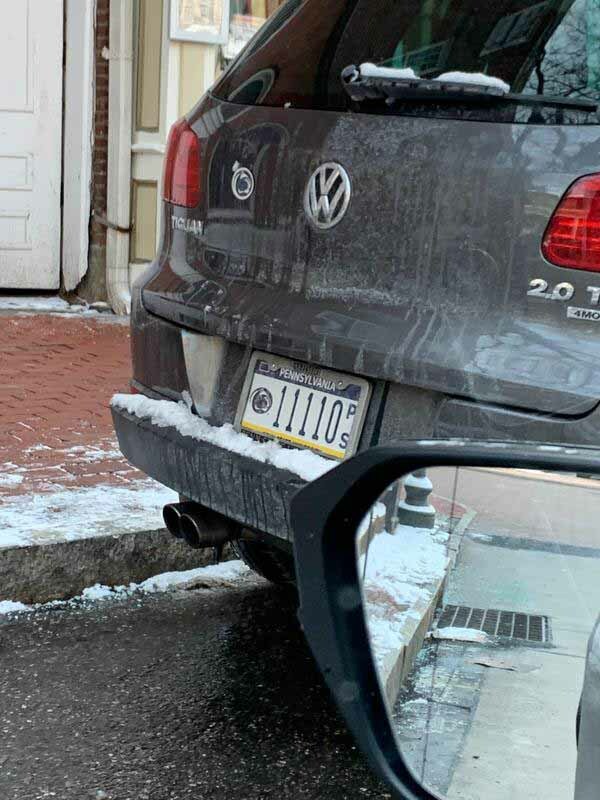 An earlier photo of a Barren Hill vanity plates was posted late in 2018. Both plates had the small map outline. That plate was spotted by Tom Perri. 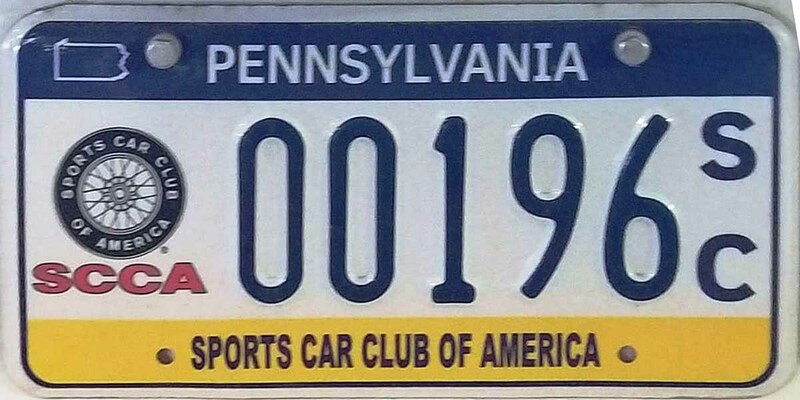 Here's the latest high Sports Car Club of America plate from Bruce Bufalini. This plate is on the latest base with the map outline. It's not known at what point that change took place, but the previous high, 00149S/C still had a validation sticker and was spotted in June of 2013 according to Tom Perri's website. 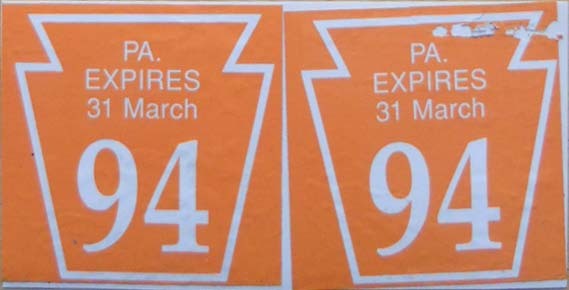 Plate type dates back to 2005. Here's a personalized Combat Infantryman Badge sent by Arthur Levine. Up to five characters are permitted. This plate is part of a series of five Combat-related plates, with the series dating back to 2014. The others in the group include, Combat Action Badge, Combat Action Medal, Combat Action Ribbon and Combat Medical Badge. Limousines are in the business of traveling, and so it is with this plate that has been spotted by both Tom Perri and Nick Tsilakis, who live in different areas of the state. It is considered the current high; however, it appears to still have the sticker well. Keep watching. At first glance, this appears to be what could be a new high Organ Donors Save Lives plate, but Tom Perri's highs page reports a high of D/N01919. This then suggests that the plate shown here is either an error or a vanity. Vanity check suggests that the number stands by itself, therefore making this a vanity. The plate was spotted by Bruce Bufalini, who also believes it to be a vanity. Here's a new high on a discontinued but still valid series. 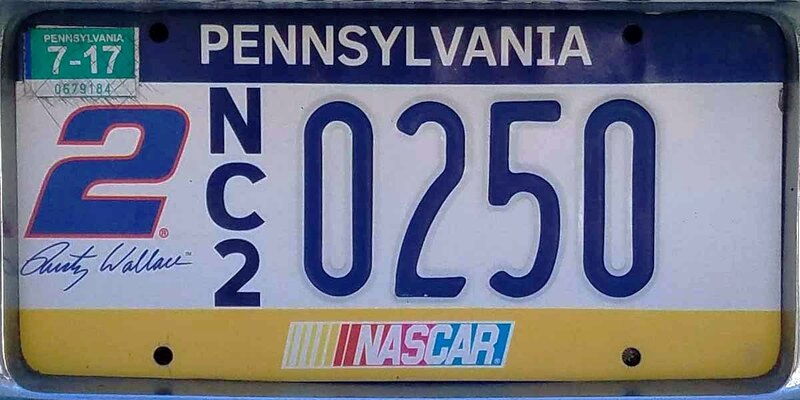 NASCAR plates were discontinued in May of 2010, but this Rusty Wallace plate is still on the road. The NASCAR 2 Rusty Wallace plates were only issued for the 2004 and 2005 racing seasons. Thanks to Jeff Lawson for the photo. 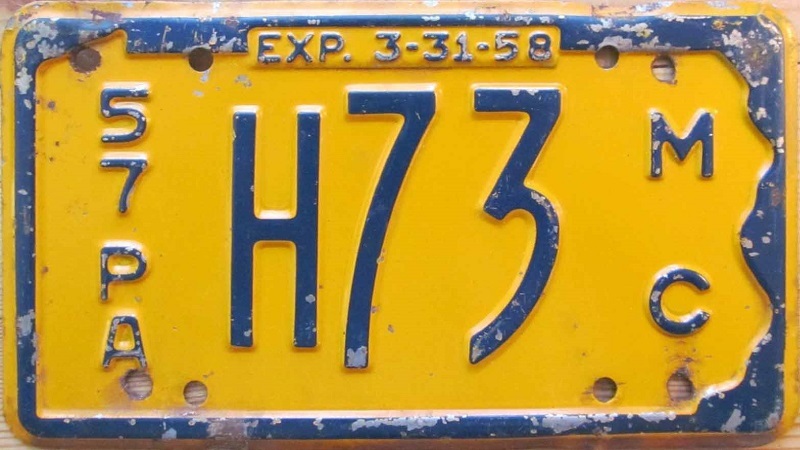 Here's an early House Car plate on the 1977 base, but judging by the number, it was likely issued in the early '80s. Later in life these plates had their tag legend changed to Motor Home, which continues in use to this day. The original HC (House Car) legend has progressed through HD, (HE reserved for Hearing Impaired), HF, HG and currently HH. Thanks to David Hassell for the use of this plate. 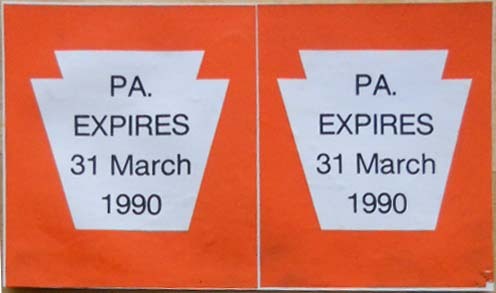 These two pairs of Boat Registration stickers represent the 1991 season with a 3-31-92 expiration, and the 1993 season with a 3-31-94 expiration. These are thanks to Bob Connison. Over the past month or so. boat stickers have been added representing 16 years; however, there are still quite a few photos needed. 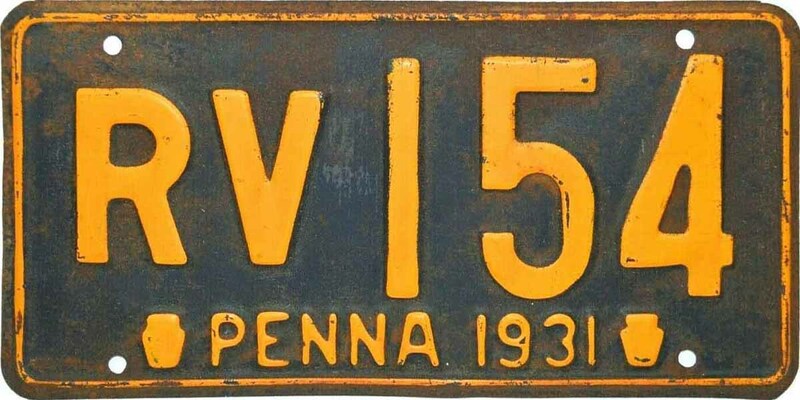 Here's a nice low number 1956 Motorcycle plate. Plate serial numbers for that year went from 1 to 9999, then the sequencing began again with an alpha prefix A, A1 to A999, B etc., extending to R713 according to Eric Tanner's website. Numbers always advance before letters. Thanks to Clayton Moore for this image. 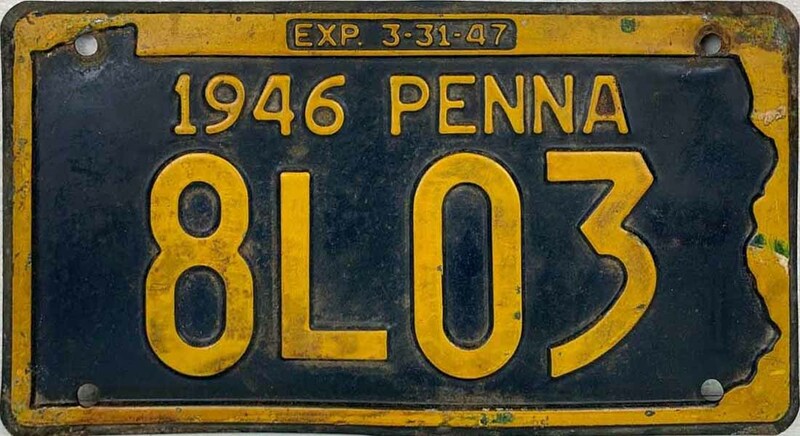 This is a 1957 Format 2 motorcycle plate. Format 1 went from 1 to 9999, then Format 2 sequencing began again with an alpha prefix A, A1 to A999, B etc., extending to V29 according to Eric Tanner's website. All such plates measured 4½" by 8". This plate photo is courtesy of Mike at Pl8source. 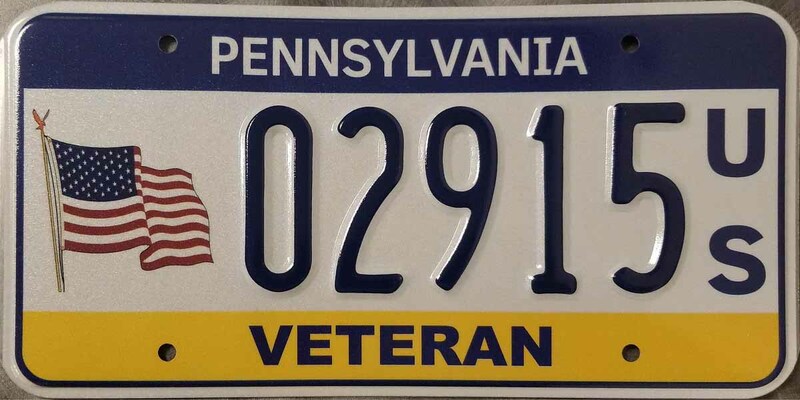 Here's the latest high number U.S. Marine Corps Veteran plate from Charles Sweitzer. Charles has shared a number of new plates with us this week. 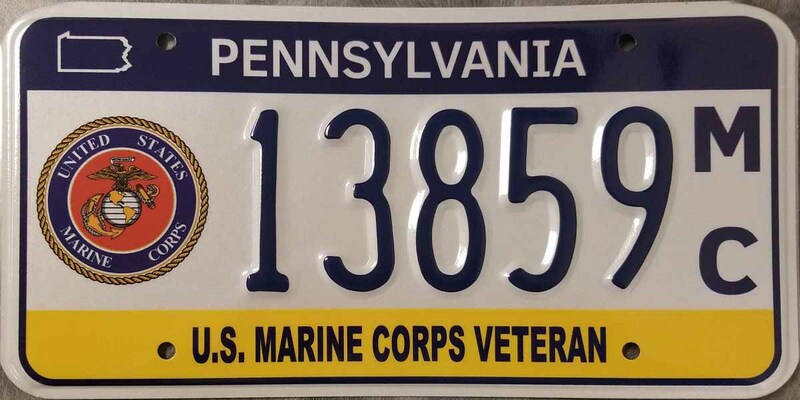 This is the first photo I have of a Marine Veteran plate with the map outline, although Tom Perri's site has 13832M/C with the map. The last plate spotted before the map was 13545M/C without the sticker well. This plate type dates back to 2009 with a starting point of 10000M/C. Next in this week's lineup is a fresh-from-Harrisburg Veteran plate. While this is the latest high, and the sticker well is gone, it does not have the map outline yet. An inventory sheet suggests this series goes to 02999U/S with the map possibly coming after that. This plate type dates back to 2005. These plates are the Motorcycle Veteran version of the plate above. The plate on the far left, also thanks to Charles Sweitzer, is another very recent issue. The other plate is older, and is being shown for comparison. Note that both the serial number fonts and the VETERAN legend font are wider than the older plate. This change was first seen on V3099 on Tom Perri's website. Here's a new high Trailer plate from Charles Sweitzer. The trailer series has had the map outline at or around XKY-0000, and were first spotted in January of 2018. No plates without both the sticker well and the the map outline have been spotted. This is not a new high, but it is the lowest number spotted so far without the sticker well. 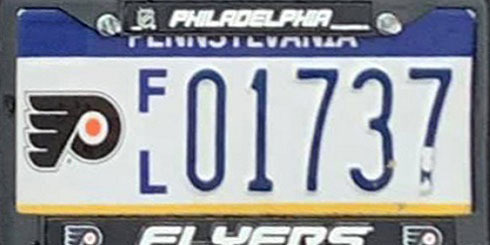 The highest known with the sticker well is F/L01652, which also had the early plate legend of Flyers Wives Charities. Then the legend switched to the singular Flyers Wives Charity, and the sticker well was removed. At this point I am of the opinion that both changes happened together. Thanks to Jordan Irazabal for the photo. Here are a couple more pairs of Boat Registration stickers. 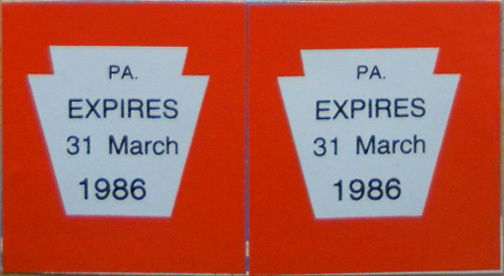 This week featuring a blue 1988 sticker with a 3-31-89 expiration, and an orange 1989 with a 3-31-90 expiration both from Bob Connison. These stickers again follow a 4-year color cycle of blue, orange, green, and red. This is an unused Handicapped Person plate from Tom Firth. It's on the 1984 base, but this 4-digit series was part of a short run of plates from HP0000 to HP9999. After that series was used, the next series had the HP symbol in the suffix position. Click the link above to see more of the progression. Here's an usual 3-character plate. It's actually a 1932 Format 2 Passenger plate which included the range of A then A1, and continuing all the way to Z9999. The serial numbers following the letter would be entirely used before he next letter came into play. So plate size was a function of the number of characters. 1 to 4 character plates were 6 inches by 10 inches, and 5 character plates were 6 inches by 12 inches. Thanks to eBay user kope2112 for the use of the photo. 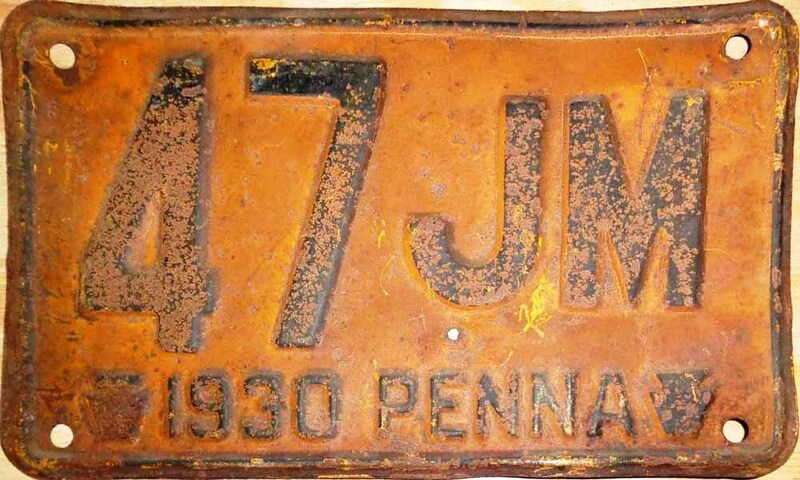 This ia a 1928 Format 2 Motorcycle plate, thanks to Clayton Moore. Format 2 means that it's part of the group of plates from 1000 to 13807. The 4 and 5-dight plates measure 4½ inches by 8 inches. Format 1 plates on the other hand had serial numbers from 1 to 999, and measure 4½ inches by 6 inches. Anyone have one? Next is this 1937 Format 1 Motorcycle plate. Format 1 plates were consisted of 1 to 4 digit plates, while Format 2 plates were the same size but the serial progression went from A1 to A99 then progressed to somewhere in the C-series, so quite rare. Plate size was 45/16" by 7⅞". Here's a recent photo of an Apportioned Truck plate from Preston Turner. What the plate shows is that the transition point to the map outline, which was previously thought to be at AG-73000, has to be above the plate shown here. The next plate spotted is AG-73399, so the map was added somewhere in between. 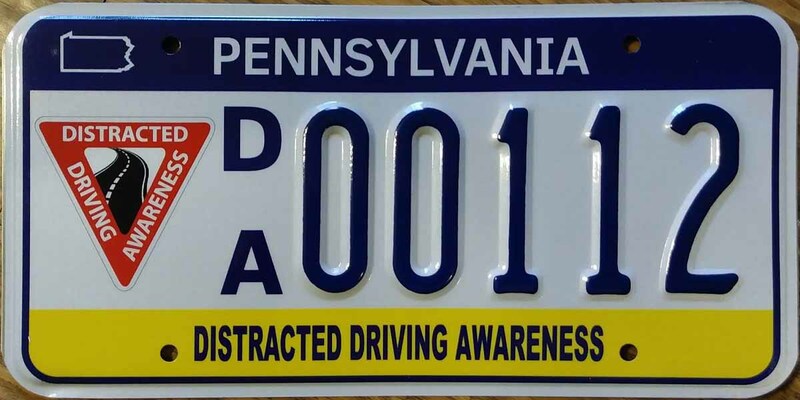 And the plate is also available in this downsized motorcycle edition of the Distracted Driving Awareness tag. Tim Martin recently received this plate and posted it on Facebook. It appears that this series may have started at D/A061 as this number and D/A062 are the only ones showing in the vanity check. Jordan Irazabal reports spotting Official Use plate PA-1063B on the blue base which is the highest number recorded on that base. This helps to narrow the gap between the blue base and the newer graphic base. 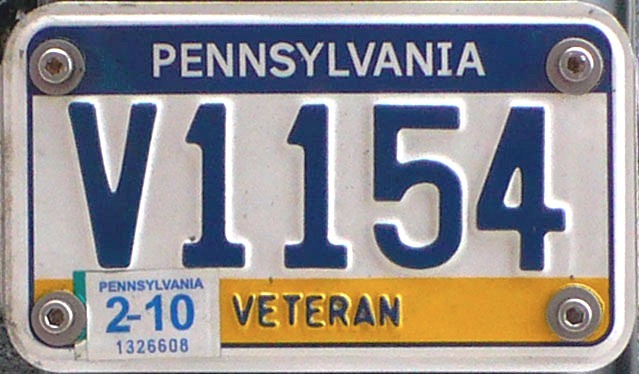 The lowest plate spotted on the graphic base is PA-2215B. This is a Pittsburgh Central Catholic High School plate which is also a new high, and still sporting a 17 sticker. The plate was spotted by Bruce Bufalini. These plates date back to 2006. 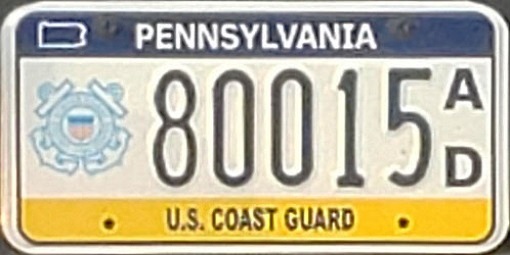 Here is the first plate spotted of the U.S. Coast Guard (Active Duty) series. These active duty military types came out in February of 2017, but so far have been elusive. The image was provided by Matthew Wehner, and the photograph was actually taken in the state of Washington. Here are a couple more pairs of Boat Registration stickers. This week featuring an orange 1985 sticker with a 3-31-86 expiration from Bob Connison, and a green 1986 with a 3-31-87 expiration from Tom Firth. These stickers follow a 4-year color cycle of blue, orange, green, and red. 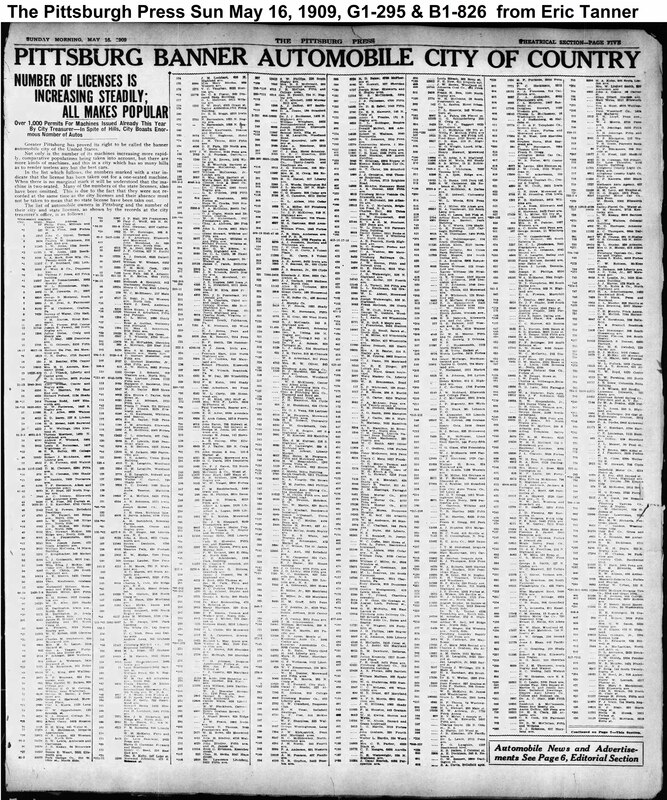 The remainder of the 1909 Pittsburgh Press newspaper clippings have been posted. 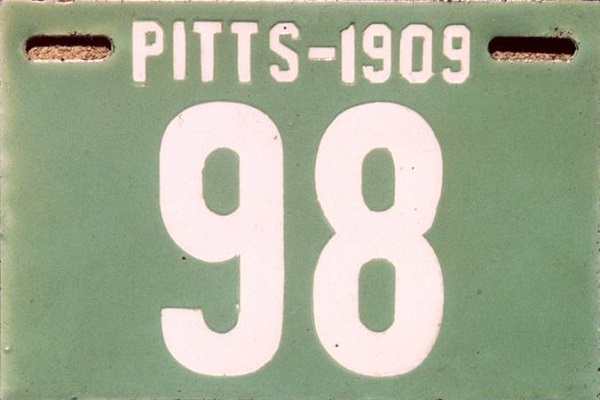 The Pittsburgh City record of the Green 98 plate can be viewed by clicking the image to the right of the plate. Then zoom the jpg until you can see the record for the single seat 98 and 2-seat 263. 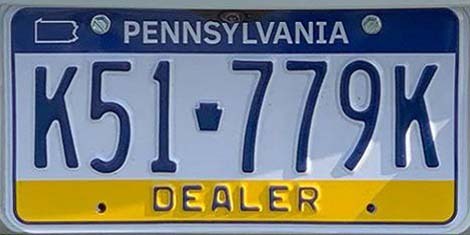 It also lists the state-issued plate, 1295 belonging to one of the vehicles. 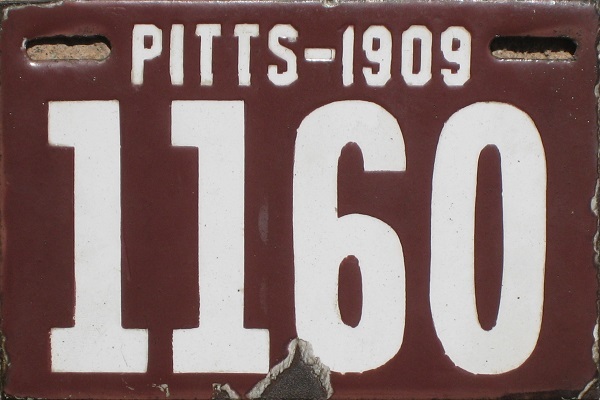 Click the image to the right of the brown 1160 to see the Pittsburgh City record for that plate with the corresponding state-issued plate of 662. Again I want to thank Eric Tanner for the great work in researching and assembling these newspaper articles. And thanks again to Eric Taylor for the plate images. 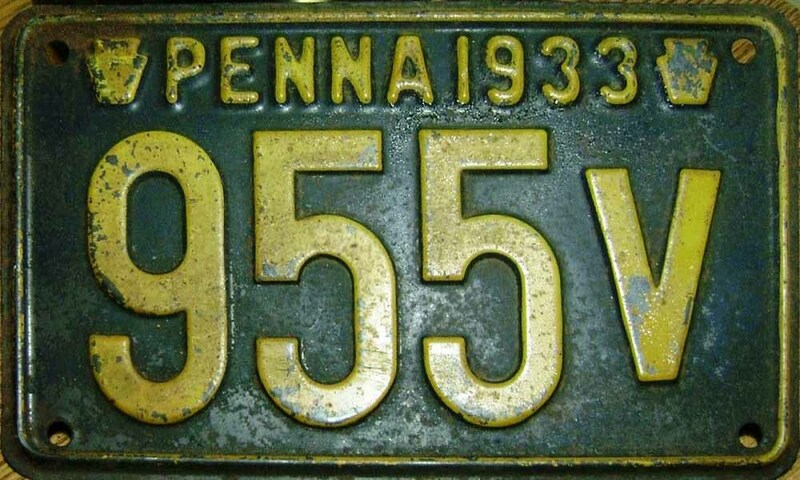 This is a 1953 Format 3 Trailer plate. Format 3 represents the serial number range of 0A00 to 9Z99. All such plates measure 6 inches by 10¼" inches. Most plates for that year were 4 characters; however there was also a run with 5 digits as well. Thanks to Rob Baran for the photo. 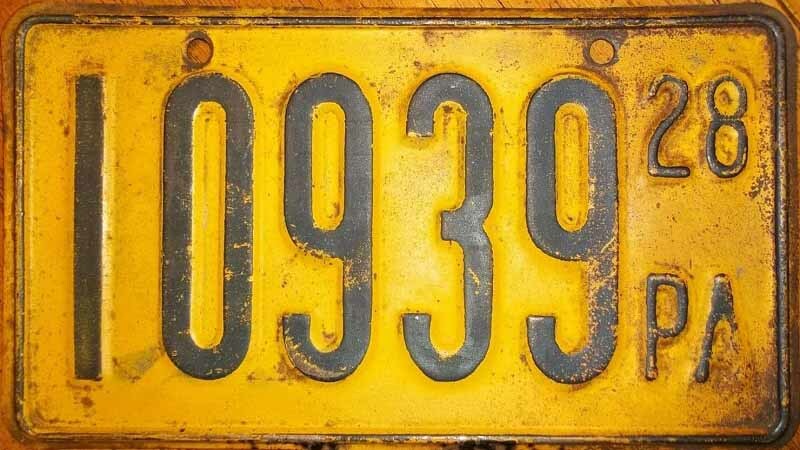 This is a 1933 S-Weight Class Truck plate. 1933 again used the R through Z, etc. weight classes, and this is the first S-class photo. The size of truck plates were 6 inches by 15 inches. 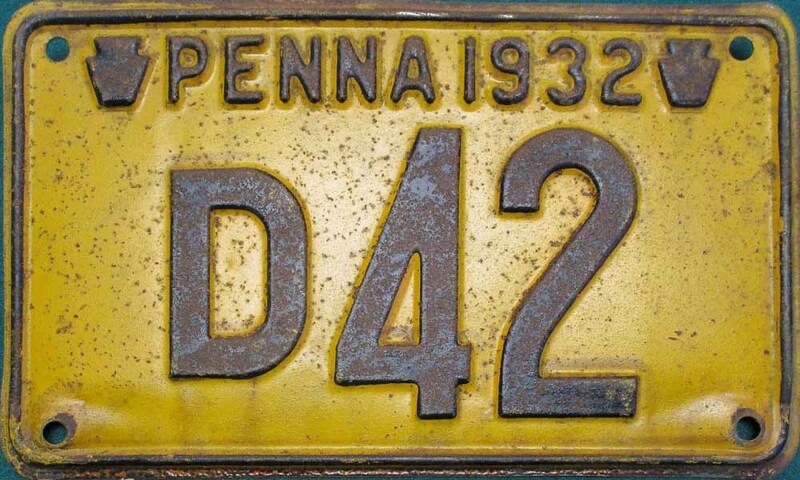 This plus the letter prefix, and the number of characters were the features that identified this as a truck plate. Thanks to eBay user hfritz2.570 for the use of this photo.